Using For Iterator in ArcGIS ModelBuilder? I'm trying to build a rather easy model but somehow couldn't find a solution to one problem: I work with a main model and a submodel which contains the iterator "for". I want to buffer a feature class ("building") with different distances. I added %value% to the output name so that the outputs are not overwritten. Afterwards I would like to use one of the outputs in the main model in a "union". But I have no idea how to get it as an input value. I thought I could open the tool and write down the path of the buffered feature class I want to use. But it's not working. I guess it's because it doesn't exists at that moment but I thought it'll work since it's created during the process of the model. Is there any easy solution? Browse other questions tagged arcgis-desktop arcgis-10.0 modelbuilder iterator or ask your own question. 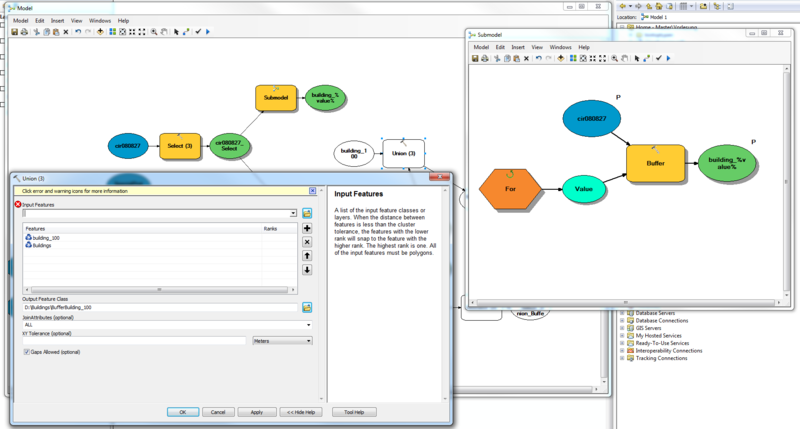 Using Feature Dataset Iterator in ModelBuilder?